The Hot Water Portable Toilet contains the standard recirculating chemical loo but in addition to the cold water version you can also have hot water from the wash basin, which is temperate controlled an have an optimum hand washing temperature of 40-43˚C. The wash basin is large enough to wash up to your elbow as per HSE Regulations. 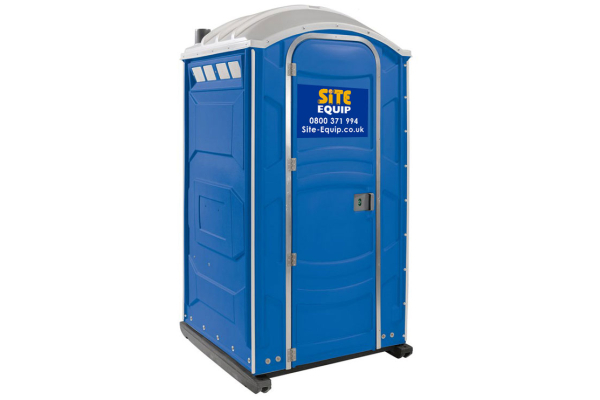 This hot water portable toilet is recommended by the Health and Safety Executive. The hire price of the hot water portable toilet includes a free weekly service, where our award winning service operators will empty the toilet, refill with clean chemical and replenish the consumables. As part of our exceptional service each unit is electrically tested prior to delivery by our fully qualified team of fitters and mechanics, who are also available as support for all customers. Why hire your hot water portable toilet from Site Equip? To run the hot water portable toilet it requires a power supply at all times, this ensures the hot water heater is working. This is especially important in those chilly winter months, as if the power is not connected to the hot water portable toilet at all times it may cause the hot water unit to freeze. These hot water portable toilets are available in 110 Volt and 240 Volt, please check for availability.